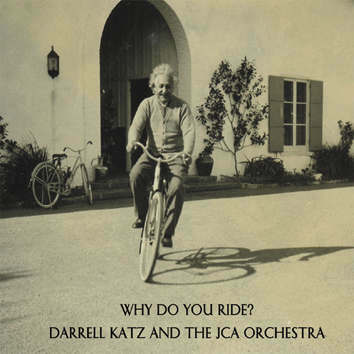 LEO RECORDS: CD LR 711: Darrell Katz & The Jca Orchestra - Why Do You Ride? JCA Orchestra is Jazz Composers Alliance Orchestra, led by the composer/arranger Darrell Katz. Marking its thirtieth anniversary this 20-strong big band is showing off Katz's bold ability to write vivid, breathtaking arrangements which goes hand in hand with his fascination with what Albert Einstein had to say about riding a bicycle, learing, knowledge, love and war. The performance of Katz's 70-minute suite combines virtuosity with irreverence, the difficult text is sung by Rebecca Shrimpton with ease and panache.